“B.Grimm Power is my life achievement and I want it to stay that way, although one day I will not be working here anymore,” Ms Preeyanart says. 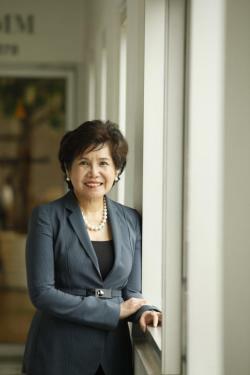 Surviving the Asian financial crisis and scepticism in the boardroom, Preeyanart Soontornwata provides the glue for the Thai-based conglomerate. 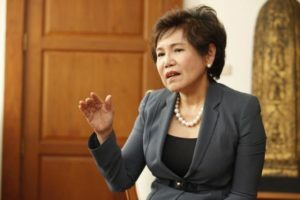 Some 20 years ago, when Preeyanart Soontornwata was in her thirties and joined B.Grimm Power Co Ltd as president and chief executive, it was a time of turmoil in Thailand. The country was facing the worst financial crisis in its history. B.Grimm Power, a subsidiary of Thailand’s oldest industrial conglomerate, B.Grimm Group, was in the process of building its first 166-megawatt power plant — Amata B.Grimm Power 1 — at Amata Nakorn Industrial Estate. The company substantially increased its borrowing in US dollar terms for the project, coinciding with the baht’s devaluation after being floated during the start of the crisis. Preeyanart Soontornwata joined B.Grimm Power when Thailand was suffering from the 1997 financial crisis. During the crisis, banks refused to make additional loans to the company, and since Ms Preeyanart was also chief financial officer of B.Grimm Group, she had to help the company’s subsidiaries negotiate with their suppliers and restructure their finances in order to survive. Today, B.Grimm Power is recognised as one of the leading private power producers with total power-generating capacity of 1,627MW. The company wants to increase its capacity to 5,000MW in the next five years. Recently, B.Grimm Power invested 8 billion baht in 15 solar power plants occupying 1,670 rai in four provinces, good for a combined generating output of 114.2MW. In addition, the company has invested through four subsidiaries and joint ventures: B.Grimm Yanhee Solar Power Ltd, Solarwa Company Ltd, TPS Commercial Company Ltd and B.Grimm Solar Power Sakaeo Ltd. It recently signed another contract to raise total capacity both domestically and overseas to 2,383MW. The company is also in the process of filing an application to list on the Stock Exchange of Thailand, Ms Preeyanart says. She is one of very few female executives in the power-generating sector. She graduated with bachelor’s and master’s degrees from Chulalongkorn University and started working as an internal auditor for the Ocean Insurance Group before joining Diethelm Management Service Co as a finance and administration manager, her last stop before joining B.Grimm in 1992. In 1992, she became chief financial officer of B.Grimm Group. In 1996, when the company started to diversify into power generation, she took a concurrent position as president of B.Grimm Power. 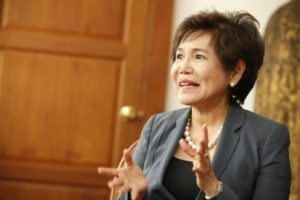 Ms Preeyanart says it was the vision of Harald Link, chief executive of B.Grimm Group and the immediate successor of the company’s founder, who saw the necessity of seeking joint ventures with other large corporations and diversifying the business into the power sector, which improved the company’s fortunes. ‘The crisis made me stronger and showed me how to protect ourselves,’ Ms Preeyanart says. “I completely agreed with him that the power-generating business was the right way to go, because it can generate revenue in the long term and there were few competitors in the market,” she says. Diversifying into power generation presented a challenge for B.Grimm, which at the time had no experience in the sector, because of massive capital requirements. These conditions forced Ms Preeyanart to personally deal with several details to push forward the power initiative. She says the chief influence in forming her life philosophy was her role model, her father, a lawyer who worked in Phetchaburi province. “He dedicated himself to his job, helping those less fortunate who were exploited by others in powerful positions,” she says. Her father valued integrity above everything else and despised corruption. She says understanding others and how they think is crucial to her job, as she has a lot of contact with people in different positions, cultures and backgrounds. Ms Preeyanart played a key role in founding the Amata B.Grimm Power Infrastructure Fund (ABPIF) in 2013. B.Grimm Group has partnered with a number of foreign companies, and some of those alliances have continued, such as with KfW, the German government-owned development bank; multinational Siemens; and Japanese trading company Sumitomo. “Back when I started, women were not very accepted in Thai management roles. This is still true now in some cultures,” Ms Preeyanart says, adding that she had to work hard to prove her worth to the company’s partners. 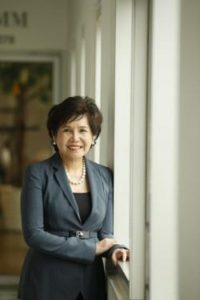 Her experience in a multicultural environment helped her succeed at B.Grimm Group, which was founded by a German but has been operating in the Thai culture for more than a century. She says one of the most important factors for her success was having “a commercial mind” and being able to bring out the best of everyone to help the company achieve its goals. 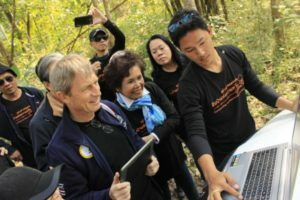 Ms Preeyanart, B.Grimm Group CEO Harald Link (left) and employees work on a reforestation project. At every meeting, she encourages everyone to speak their minds to help the team make the right decision. “I want it to be a collective decision that everyone agrees upon. I don’t want anybody to bring up their opinion later,” Ms Preeyanart says. One of the concepts she always stresses when doing business is “no cheating” and how to set up a system to prevent cheating at the company. 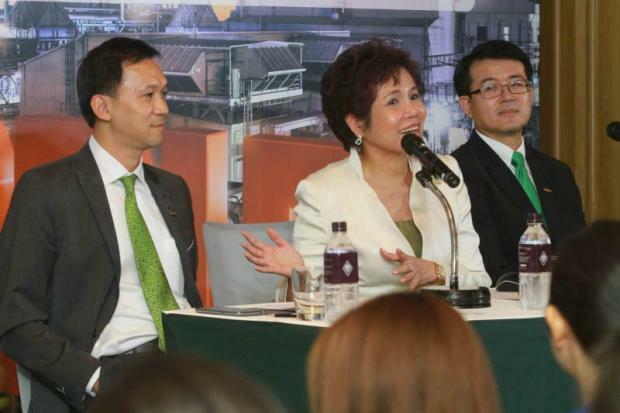 “Each of our power plants is worth more than 5 billion baht. I think it is very tempting to cheat in the equipment-purchasing process,” she says. She set up a system of checks and balances to prevent fraud and corruption in equipment purchasing. Ms Preeyanart hopes it also fosters honesty and transparency in the company. She says Mr Link is another role model for her because of the way he respects his employees, giving them the opportunity to do their job and making them feel like they are a part of the company’s success. He was the one who taught her the company’s motto — doing business with compassion — and inspired her to do the same. Ms Preeyanart says that while she works hard, she always finds the time to travel abroad, take a rest and learn about different cultures. Ms Preeyanart says the secret to her success in management has been to put her heart into her work and understand the people she is working with. In her free time, Ms Preeyanart likes to read books and newspapers to catch up on what’s happening in the world. She is interested in learning about different kinds of people to help her better understand how to deal with them. “Recently I have been interested in reading articles about Generation Y so I can understand how they think,” she says. This is important because B.Grimm Power regularly hires young talent and the company wants to groom them for leadership roles. “I want the company to remain strong even after I retire, so I need to understand what people in the new generation think,” Ms Preeyanart says.